Please Contribute--email your info toNorm Vance. Johnny Redmund and his mail wagon. The following is an article that was published in Curtisville 1866-1976. The Tote Road came from the Thompson Farm (near the Rollways) to Wilber Creek. There was a deep cut here and the road turned sharply at the bottom. A large hemlock tree about three or four feet through stood at the turn. Ebenezer D. Curtis bored holes in the tree, up and down, and then took a chisel and made a big slot. As the teams came down from the North, they picked mail up and took it to Tawas. 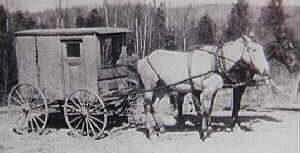 On the return trip they brother the settler's mail back and put it in the slot in the hemlock tree. Some winters, Ebenezer D. Curtis snow shoed to Mack City, a lumbering town near Mack Lake, to pick up the mail. The post offices were in homes. Those who held the post master or mistress position were: Joseph Bell, Edward Bell, Albert Spencer, Eva Heilig, John McMillen, Hannah Phillips, Mary Ellen Gordon, and Pauline Byler. During the time the Alcona Dam was being built, many of our people used the post office there. The post master was Mary Freeman. The clerk was Laura Gordon Beddy, a resident of Glennie. In 1947, there was a big blizzard and the roads were impassable for some time. Russell Anthony, our mail carrier, had a pilot from South Branch fly the mail in. Russell tied the mail in bundles and dropped it at each house. The above material and photo submitted 1997 by Ronald J. Sortor. Thanks Ron.